Shahid Kapoor, who is currently busy filming Batti Gul Meter Chalu in Uttarakhand, is being missed at home by wife Mira Kapoor and daughter Misha and Mira's latest Instagram post corroborates it. 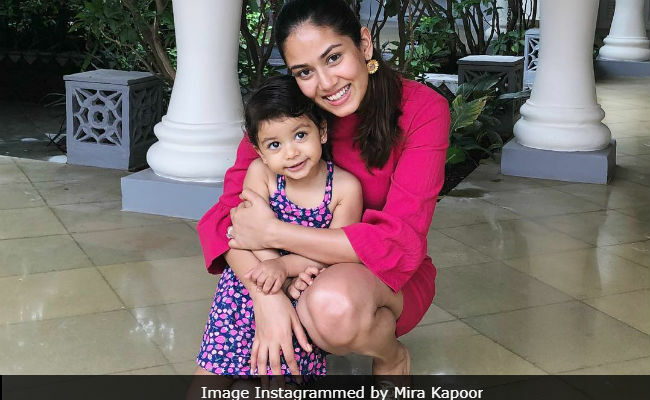 Mira shared a million dollar picture of herself along with daughter Misha Kapoor on social media and mentioned in the post that she misses Shahid. She also teased the actor about all how she's loving all the "extra hugs" that she receives from Misha in his absence (you want to hurry up, Shahid). Mira wrote: "Yes we miss you Shahid Kapoor but I'm loving the extra hugs all for myself!" Mira can be seen wearing a hot pink dress while Misha looks all dolled-up in a printed dress and pink crocs. It wouldn't be wrong to say that the picture in setting the Internet ablaze and how. The picture received over 1 lakh likes within a few hours and remarks such as "cuteness overloaded" and "adorable" kept popping up in the comments section. Take a look at Mira Kapoor's post here. Yes we miss you @shahidkapoor but I'm loving the extra hugs all for myself! Mira Kapoor keeps her 1 million followers on Instagram engrossed by documenting different facets of her life, from sharing pictures of their "babymoon," to announcing her pregnancy. Last month, she shared an adorable photo of Misha Kapoor and wrote: "Growing up too fast." Mira, who is expecting a second child, announced her pregnancy in April by sharing an adorable photo of her daughter on social media. Take a look at some of the posts from Mira's mommy diaries. Mira Kapoor and Shahid Kapoor got married at a private ceremony in Gurgaon in 2015 and welcomed daughter Misha Kapoor in 2016. Meanwhile, Shahid is busy with the shooting of Batti Gul Meter Chalu, co-starring Shraddha Kapoor and Yami Gautam. The film is a social drama, where Shahid will be seen playing the role of a common man. Shahid was last seen in Sanjay Leela Bhansali's "Padmaavat".